As co-advisor of Point Park's Alpha Phi Sigma chapter, Sean Martin, Ph.D., inducts Nicholas Salak into the honor society. 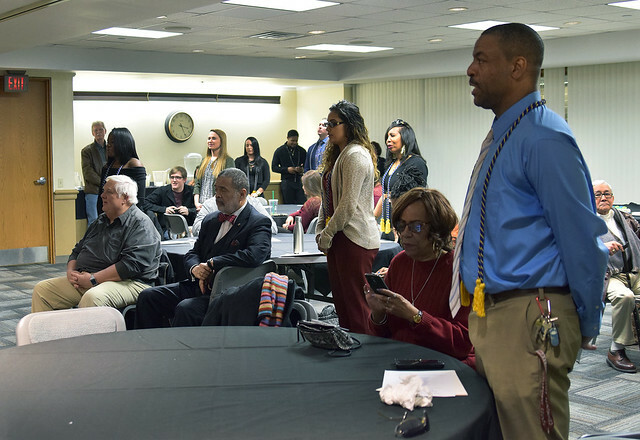 The Department of Criminal Justice and Intelligence Studies at Point Park University inducted the following 13 undergraduate and graduate students into the Alpha Phi Sigma National Criminal Justice Honor Society at a ceremony on campus March 23. "Our induction ceremony was not only recognition of past exemplary conduct and academic achievement, but designed to emphasize future achievements and to serve as an inspiration for the four ideals of the criminal justice honorary: academic excellence, leadership, service and unity in the profession," explained Richard Linzer, J.D., associate professor and director of the M.S. in criminal justice administration program. Linzer, faculty advisor of Point Park's Alpha Phi Sigma chapter, added: "From scholarships, awards and grants to networking, interview tips and job postings, there are my many benefits for our students who are inducted into this national honor society. They also fulfill a GS 7-level requirement for federal service employment." CJIS department faculty and staff Gregory Rogers, J.D., Sean Martin, Ph.D., Edward Strimlan, M.D., Andrew Richards, M.A., and David King, M.A., along with students' family members, attended the ceremony in which inductees received certificates, pins and honors cords for graduation. "Being inducted into the Alpha Phi Sigma National Criminal Justice Honor Society was a tremendous honor. It has given me the motivation to work even harder to achieve and maintain academic success at Point Park University and to succeed at all aspects in life including work," said Salak, a sophomore criminal justice major from Burrell High School in Lower Burrell, Pa., who plans to become a Pennsylvania State Trooper. "I am already in the process of being selected for an academy class," Salak added. "This was such an accomplishment for me. I have worked so hard my entire college career," said Welch, a senior criminal justice major from Ringgold High School in Donora, Pa. "After graduating this April, I will begin the master's degree program in global security and intelligence at Point Park. My career goal is to work in fighting human trafficking." "I work as hard as I can to make sure I achieve all that is possible. Being inducted into this honor society was a great reassurance of my work," said Carr, a junior criminal justice major from Pittsburgh Brashear High School. Carr's career goal is to be a criminal investigator. She added: "I chose Point Park because of its excellent criminal justice program and the advantage of the University being in the city and having many connections and partnerships with local and national agencies." Horak, a senior forensic science major from Southmoreland High School in Scottdale, Pa., said the induction ceremony was a reminder of her academic accomplishments and commitment to the criminal justice field. "This is something I have worked for during my years at Point Park so it was such an honor to reach this achievement," said Horak, who plans to pursue a career as a forensic investigator. "Point Park and its faculty have been helping me reach this career goal since freshman year. The faculty have helped me immensely by advising my class schedules, providing on-campus internship and career fairs catered directly to the criminal justice, forensic science and intelligence fields, and having multiple speakers from federal, state and local agencies," explained Horak. She added: "The faculty at Point Park are always there to answer my questions. They go above and beyond for students, making sure we are as successful as possible."